WASHINGTON — We saw five big storylines emerge from last night’s primaries and runoffs in Arkansas, Georgia, Kentucky and Texas. Not only did Stacey Abrams (in the primary for Georgia governor) and Lizzie Fletcher (in the TX-7 runoff) win their female-vs.-female races, but Amy McGrath beat Jim Gray in the KY-6 race; Lupe Valdez won the gubernatorial runoff in Texas; and Gina Ortiz Jones will be the Dem nominee in the competitive TX-23 general election. What’s more, women won the Democratic nominations in GA-6 and GA-7. The only notable races where female candidates came up short were in TX-21 (where better-funded Joseph Kopser beat Mary Wilson) and TX-32 (where Colin Allred defeated Lillian Salerno). 2. Democrats look stronger in Georgia than they did in 2014. But will that be strong enough for the fall? Approximately 50,000 more Republicans participated in last night’s GOP gubernatorial primary than in the Democratic primary (608,000 to 553,000). By comparison, nearly 300,000 more Republicans voted in the competitive 2014 Senate primaries (605,000 to 329,000). Maybe the best news for Stacey Abrams is that the GOP gubernatorial contest will go to a runoff between Lt. Gov. Casey Cagle and Secretary of State Brian Kemp, since neither surpassed 50 percent. That runoff takes place two months from now on July 24. The DCCC’s preferred candidate, Lizzie Fletcher easily beat insurgent Laura Moser, 67 percent to 33 percent, suggesting that last week’s progressive upset in NE-2 was the exception rather than the rule. And when you think about it, was the Kara Eastman’s win over moderate Brad Ashford in NE-2 about ideology? Or gender? So far this cycle, we’ve noticed that, when all things are equal, female Democratic candidates are beating male candidates in one-on-one races. Not only did Moser lose in TX-7, but Our Revolution’s other pick in Texas — Rick Trevino in TX-23 — got trounced by Gina Ortiz Jones. 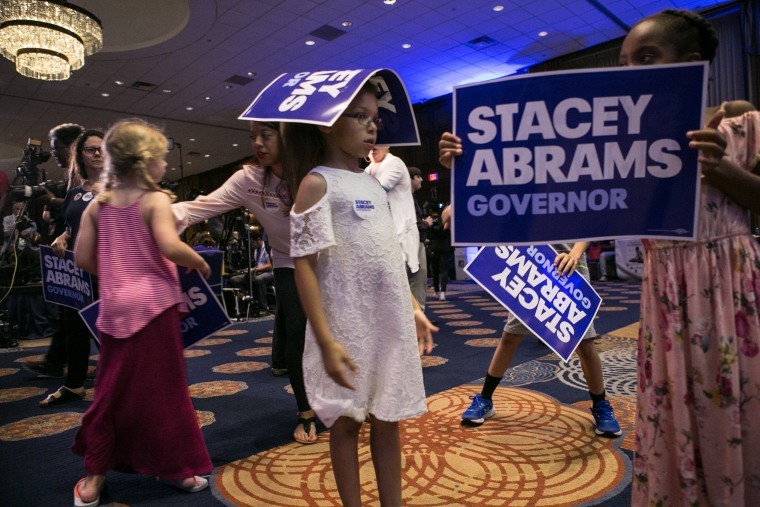 The group did back Stacey Abrams in Georgia, but so did almost every other national Democratic group. Amy McGrath, the retired Marine lieutenant colonel fighter pilot who beat Lexington Mayor Jim Gray last night, has the chance to be a real star if she wins in November. And as ABC notes, McGrath isn’t the only woman from last night with an interesting biography. “A former Marine fighter pilot and mother of three is the nominee for a House seat in Kentucky. A former Air Force intelligence officer and the daughter of a Filipina-American immigrant [Ortiz Jones] got the Democratic nod for a top-target House seat in Texas. Georgia’s race for governor will feature a candidate [Abrams] who would be the first black woman to be governor of any state.” Additionally, Lupe Valdez is the first Latina and the first openly gay person nominated for Texas governor by a major party. By the way, McGrath’s victory over Gray is the reason why parties SHOULD WANT primaries; the competition makes a candidate stronger. One of the clear giveaways in the entire Russia investigation has been to compare how Democrats and Republicans on the Senate Intelligence Committee have behaved (in a bipartisan, cautious manner) with how the Trump White House and House Republicans have behaved (usually in bad faith). If you’re acting in bad faith, it’s hard to take you seriously or credibly. And speaking of acting in bad faith, here are Trump’s tweets this morning regarding the news that the FBI had an informant speak with 2016 Trump campaign officials as part of the FBI’s counterintelligence investigation. “Embattled Missouri Gov. Eric Greitens has purchased at least $185,000 in television ads — set to begin airing this week — in a year when he is not on the ballot,” the Kansas City Star says. “Greitens posted the ad to his personal Facebook page Tuesday afternoon. ‘Court documents prove the fake news paid thousands for allegations against Greitens, a liberal St. Louis prosecutor funded by George Soros pressed charges and Democrat leadership orchestrated the false attacks,’ the ad claims.” Here’s the TV ad. This is a nightmare for the GOP, especially when Democrats are airing their own TV ads linking Greitens to Senate candidate Josh Hawley.